Here’s a wonderful piece by Jonathan P. Katz, a recent graduate of the University of Chicago, at New Voices, called “Apocalypse Now: Preparing for the Potential End of Jewish Statehood.” Katz states that he comes from the heart of the Jewish community and is for two states and implies that he is a Zionist, but he is prepared to abandon all these attachments in the face of reality, and because he finds nationalism so objectionable. Attention: I am doing something that is heretical across much of the Jewish spectrum. Very heretical – for two-state JStreet-ers, for your right-wing grandma at synagogue Kiddush, and certainly for anyone remotely associated with StandWithUs and other organizations dedicated to apologetics for the Occupation. I am preparing for the potential end of Israel as we know it. I am preparing for the potential end of Jewish statehood. I do not mean “Exile 2.0” or some sort of apocalyptic genocidal nightmare. What I mean is the replacement of the current political system with something in which the region might be governed in a binational state, or some other form of government in which Jews are no longer the absolute majority (or hegemonic). Jews would stay, but would not rule alone. And so I’ve started the slow preparation for the case that Israel is no longer a Jewish state. Would I be completely prepared? Probably not – a restructuring of the political situation in the Holy Land, even in the “best case scenario,” would completely upturn the Jewish communal landscape and the way American Jewry perceives itself. It is not so easy to undo seventy years of one system. But starting the process of looking at a strange and different potential Jewish future is something that I think will help with the big change that may be down the line. Who cares if it is heretical? This syncs with my belief that the most disputed territory is between American Jews’ ears. The upturning of the Jewish communal landscape involves the fact that Israel was the world’s answer to the Jewish question in Europe, one of the great perplexing social questions of modernity, and guess what, it wasn’t the answer. Getting Jonathan Katz up to the microphone means that the Jewish state might end with a whimper not a bang; i.e, by preparing Jews for this eventuality, there will be a soft landing, and the outcome won’t be Algeria. Update: Thanks to commenters for pointing out that I’d translated Independence Day as the commemoration of the Holocaust. Apologies. This syncs with my belief that you are hopelessly naive and ahistorical in your analysis. What do you mean? This: “…there will be a soft landing, and the outcome won’t be Algeria.” ??? Observing this evolving collective realization from the outside is like watching one of those Wayan brothers “Scary Movie” flix. Jeffrey Goldberg as the dumb blond, etc. It’s kind of humorous to watch everybody in the movie run around acting clownish and contrived when everyone watching knows how it ends. That’s not to say that this kid is part of the buffoonery. He’s not. He’s a chronicler. He’s talking in the theater. He’s trying to tell the actors how “Scary Movie” ends. Why don’t they listen? how does it end ? …..how do you think it ends……. I don’t know whose parenthetical definition of Yom Ha’atzmaut was in Katz’s narrative, but it’s certainly wrong. Yom Ha’atzmaut doesn’t commemorate the Shoah. It’s what we know in English as Independence Day, celebrating the declaration of the Israeli state in 1948. Not that that declaration is something to celebrate. Palestinians COMMEMORATE the same event as Youm an-Nakba (Day of the Catastrophe), which ironically translates to Yom HaShoah in Hebrew. And truly, as Katz and so many Jewish followers of this website have come to realize, it has turned out to be a shoah for Jews as well as for Zionism’s Palestinian victims. What’s happening here? Israel’s independence day is also Nakba day. Solution? Without the Shoah, the responsible goy world would never have legitimized Israel. Turns out they were not really very responsible. Now we have to pick up the pieces. The USA is the major malfunction here. Katz is a truth teller. Very dangerous for the IDF herders. They don’t have anything to counter it with. Well, I would think that the Biblical interpretations that are generally accepted by Zionists would not be quite intact in the event of ‘equal sharing’, would be in need of a bit of reconstruction. MHughes: point taken, but whilst we all know Zionists want it all, they can’t betray their aspriations to their opponents. Like Netanyahu constantly exclaims that Israel wants peace, he’s never willing to deal with the things that will bring peace, which is either retreating to the 1967 borders or allowing equal rights. Like Netanyahu constantly exclaims that Israel wants peace, he’s never willing to deal with the things that will bring peace, which is either retreating to the 1967 borders or allowing equal rights. “Retreating to the 1967 borders . . . will bring peace”? The Mondoweiss online community doesn’t believe that as far as I can tell. No, you don’t have to share land equally. land is distributed by the market. Once Jews are legally protected in land purchase titles in a one state, the Arabs will sell it willingly and enthusiastically, as they did prior to Israeli independence. Billions will pour in from abroad to aid in the purchases. They will move to other adjacent states with their cash sales. Those left will be homeless and landless, wage slaves, guest workers in their own country. Much like for most of America. Multicultural free trade equal opportunity means You open your markets to those with capital and/or access to preferential financing. It has nothing to say about the outcome. MY COMMENT: It pains me to suggest that this fantasy is not really so different from the “white supremacy” fantasy advocated (at one time, at least, if not currently) by the likes of David Duke. In point of fact, The combination of Islamophobia and sixty plus years of Israeli “Iron Wall” militarism has made Likudnik Israel and right-wing Jews quite popular with many right-wing groups that were once considered anti-Semitic. Israeli flags are now showing up at demonstrations by far-right (white supremacist) groups like the English Defence League (EDL) and the neo-Nazi Golden Dawn (political party) in Greece.
. . . 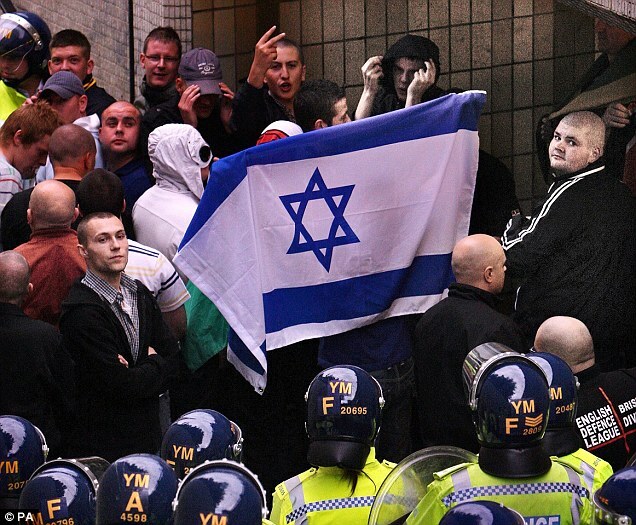 Along with its activity vis-a-vis the Muslim minority in Britain, the EDL takes a special interest in the Middle East and the Israeli-Arab conflict.Lake puts forward several rhetorical questions, such as whether there was any point in the Oslo process, because he says “those Norwegians” can’t be trusted. What’s the point of international decisions, Lake [an EDL member who is not Jewish] asks: The UN also voted for the partition of Palestine, but the Arabs then started the war. MY ELABORATION: It’s not just Europe that’s losing its mind. Not by a long shot! ! ! Hey! Hey there! Yoo-hoo! Is anyone listening to Phil, Adam, Jonathan P. Katz, et.al.? 1 English ( local white ) can demonstrate against war . That activity will be portrayed as expression of democracy lacking in Muslim countries. But a Muslim can’t oppose war within the west. 2 The claims of Gaza turning into dust bowl and economic ruin after Israel withdrawal is to remind how great that land was under Israel. But the forgotten pieces – that the majority of the population did not benefit prior to Israeli withdrawal and the housing business,infrastructures were destroyed by the departing Jews in addition to the continued blockade in the name of the fighting Hamas – are conveniently blotted out . 3 – The tendency to team up with the worst racist is not new to the Zionism movement . The aims have always justified the means for the Zionist. Denouncing David Duke may be preoccupation for the indoctrinated Zionist but they would not see the sheer hypocrisy in aligning with thousands David Duke if that suited their immediate needs. Interesting. About two weeks ago, Mondoweiss had an article concerning Jewish leaders and anti-Zionist Jews in which Elana Kahn-Oren appeared (to me at least) to be imagining some form of post-Israel Zionism in which the Jewish state would no longer be the core unifier of Jewish tribalism. It appears to me that Jonathan Katz is thinking along similar lines. Zionism came into being in response to modernity and the fragmenting of Judaism. And while Zionism has been surprisingly successful in achieving its goals, it’s serious contradictions make its future problematic. It would seem that at least some of the Jewish leadership and future leadership with a strong sense of Jewish community are seeking an alternative to Zionism and a Jewish state as a means of perpetuating Jewish tribal cohesion. Post-Zionist Zionism? Any State completely dependent upon it’s self understanding as the persecuted, ongoing conflict with the world, and at the same time never ending financial dependency upon the “outside,” is simply unsustainable. Israel does not have the leadership to turn this around. Without fundamental change (unlikely) Israel as we know it simply cannot survive. In this respect — it’s un sustainability– it is no different from most all modern States of the Middle East. Mr. Katz’s reluctant, analytical awakening is better than no awakening at all, but he sure ain’t no Tzvia Thier.